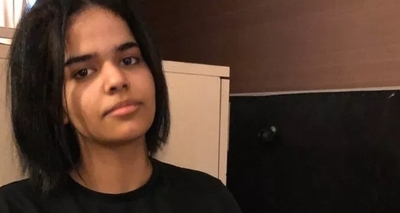 When Rahaf Mohammad Alqunun barricaded herself in a Bangkok hotel room earlier this month and took to Twitter, begging the world to protect her from being forcibly sent home to Saudi Arabia, it was a desperate cry to save her own life. But she also was speaking for millions of other Saudi women, whose lives under patriarchal rule deprive them of their freedom, keeping them permanently at risk of abuse, imprisonment, or even death. Now Alqunun,18, has been granted asylum and is beginning a new life in Canada. But her struggle does not end there. Alqunun escaped from her parents Jan. 5 while on a family trip to Kuwait, slipping from their sight onto a flight to Thailand. She had endured years of horrific physical abuse at the hands of her parents, including being locked in a room for six months and beaten. The reason: they didn't like the way she'd cut her hair. Yet by fleeing, she potentially faced even worse punishment from a country where women are legally forbidden to travel without a male guardian – usually their father or husband – and where girls who disobey their fathers can go to jail. In the photographs she posted to Twitter, she appears in a T-shirt with bare arms, and no veil – acts of "immodesty" that conservative Muslims, and so, most Saudis – consider a dishonor to the family. And women who dishonor their families are likely to be killed by them; as Human Rights Watch deputy Middle East director Michael Page told the New York Times, "Saudi women fleeing their families can face severe violence from relatives, deprivation of liberty, and other serious harm if returned against their will." But even facing those dangers, the teen now risks another: "They will kill me because I fled and because I announced my atheism. They wanted me to pray and to wear a veil, and I didn't want to," she told the New York Times. In Saudi Arabia, renouncing Islam is punishable by death. Alqunun's story has received worldwide attention and her courage has led many to hope that international pressure will help incite change in the Kingdom. 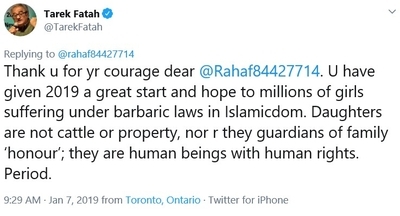 In a Twitter message directed to her, Canadian journalist and activist Tarek Fatah wrote: "Thank u for yr courage dear @Rahaf84427714. U have given 2019 a great start and hope to millions of girls suffering under barbaric laws in Islamicdom. Daughters are not cattle or property, nor r they guardians of family 'honour'; they are human beings with human rights. Period." But Saudi Arabia's leaders, particularly Crown Prince Mohammad bin Salman, are a long way from recognizing such basic human rights. A recent rush to arrest human rights activists, and women in particular, testifies to this, along with a crackdown specifically on those men and women who call for an end to the male guardianship system. Their goal: to do away with a system under which women may not leave the home, study, travel, marry, or even, apparently, cut their hair, without the permission of their father or husband. As the New York Times noted, "Saudi men use a government website to manage the women they have guardianship over, granting or denying them the right to travel, for example, and even setting up notifications so that they receive a text message when their wife or daughter boards a plane." Saudis take opposition to this system seriously. All the arrested women's advocates stand accused of being national security threats and agents of foreign governments. In prison, according to Amnesty International, those arrested have been "repeatedly tortured by electrocution and flogging, leaving some unable to walk or stand properly. In one reported instance, one of the activists was made to hang from the ceiling, and according to another testimony, one of the detained women was reportedly subjected to sexual harassment, by interrogators wearing face masks." Among them is Samar Badawi, whose brother Raif Badawi made headlines after being sentenced to 10 years and 1,000 lashes for blog postings the regime called "insulting to Islam." A longtime fighter for the end of male guardianship, and the 2012 recipient of the U.S. International Women of Courage Award, Samar Badawi was first arrested in 2010 for "disobeying" her drug-addicted, abusive father by escaping to a women's shelter. Since then, she has taken part in the fights to allow Saudi women to drive and for freedom of dissent – all of which led to her latest arrest in July, together with another women's rights activist, Nassima al Sadah. Both women are reportedly being held incommunicado, although it is rumored that Samar Badawi is now at maximum security Dhabhan prison, where her brother is also being held. They are by no means the only ones. In May, officials arrested Loujain al-Hathloul, a social media star who has also campaigned for the right to drive – even though the driving ban had already been lifted. Al-Hathloul, 29, is known for driving from the UAE into Saudi Arabia in 2014, an act for which she was charged with terrorism and spent nearly three months in jail. Two years later, she went further, signing a petition against male guardianship. For that, she was "arrested without charge and...unable to contact her lawyer or family members until she was eventually released shortly after," Al Jazeera reported. And there are more activists: Amnesty International last August counted a total of at least eight women and four men, all being held without charge. Yet despite all the arrests and the torture of such rights activists, despite the ongoing atrocities perpetrated in the Saudi war in Yemen, despite the murder of Washington Post reporter Jamal Khashoggi, Crown Prince Mohammad bin Salman (or "MBS," as he is known) continues to position himself as a kind of reformer, a new, young voice for a freer, more modern Saudi Arabia. And often he gets away with it, hiding behind his simultaneous crackdown on ultraconservative religious leaders, and by cozying up to Western world leaders, with money, oil, and often just mere flattery. And perhaps he even sees himself as such, for all his abuses. The cases of women like Samar Bawadi and Rahaf Alqunun, their incarceration and persecution both by their families and the state, articulate clearly the extent to which patriarchal systems and views of women are entrenched not just in Saudi culture, but in its psyche. This is a country where women now may drive if the royal family says so, but they may not ask to have that right in the first place. It is a country where a girl or woman (Badawi was 29) who disobeys her father commits a crime, where the government will intervene to enforce her familial and legal place. "I want to be protected in a country that will give me my rights and allow me to live a normal life," Alqunun told the New York Times while still barricaded in her Bangkok hotel room. She now will have that chance. But her story shows that this kind of happy ending is still a long time coming for the women she leaves behind.